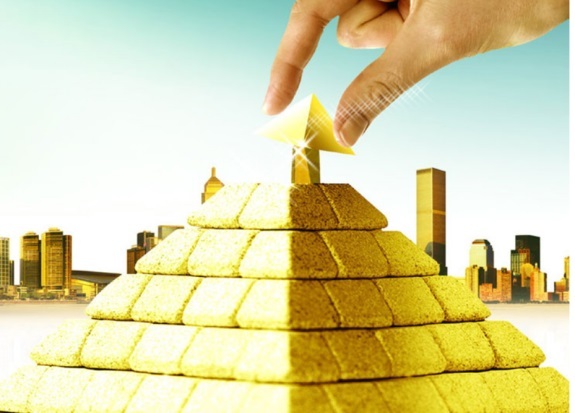 A giant human hand puts the top piece on a golden pyramid. Source: Global-Unity website. Updated 6:24 p.m ET (U.S.A.) Members of the WCM777 scam, which morphed into Kingdom777 after regulatory actions were filed, have been informed by a “program” upline that the venture now is operating as Global-Unity, a source told the PP Blog today. Parts of the Global-Unity website appear to be under construction. The “News” tab, for instance, includes no releases. Strangely, though, it does include a photo of a giant human hand placing what appears to be the top piece on a giant golden pyramid. Whether the photo was designed as a taunt to regulators was not immediately clear. Promoters of the alleged TelexFree pyramid scheme also recently have used images of a pyramid in promos. WCM777 is the subject of regulatory actions or Investor Alerts in the United States, Canada and Peru. TelexFree is the subject of a pyramid probe in Brazil. JSSTripler/JustBeenPaid purported to pay 2 percent a day (precompounding). The original scam changed names at least twice after the Zeek Rewards’ Ponzi action by the United States in 2012. Zeek was a scam designed to make investors believe they’d received an average payout of 1.5 percent a day, the SEC said. JSS/JBP’s Mann was a former AdSurfDaily Ponzi-scheme pitchman and appears to have had sympathies for “sovereign citizen” political extremists in the United States, including convicted “militia” man Francis Schaeffer Cox. A scam known as “Profitable Sunrise” that became the subject of state and federal regulatory actions in the United States last year once promoted a 2.7-percent-a-day investment “plan” known as the “Long Haul.” The Long Haul payout purportedly was due April 1, 2013 — April Fool’s Day and the day after Easter. Profitable Sunrise, like both WCM777 and TelexFree, was targeted at Christians. Both the “Long Haul” name and the purported payout dates could have been taunts. In promos, TelexFree, WCM777 and Profitable Sunrise each used an image of the Christ the Redeemer statue in Brazil. Quick note: An image of the American flag is in the upper-right corner of Global-Unity site. Looks like the scammers still are trying to rope in Americans and other peoples of the world. There’s also an image of the flag of China. It will be interesting to watch this one to see where it goes. Ming has been very quiet lately..
http://worldjournal.com/bookmark/24568430–font-color-red-font-3 It’s in Chinese, of course. May be of some use as referral. It mentioned that any investors of ANY language should contact the authorities. Authorities will provide translators.